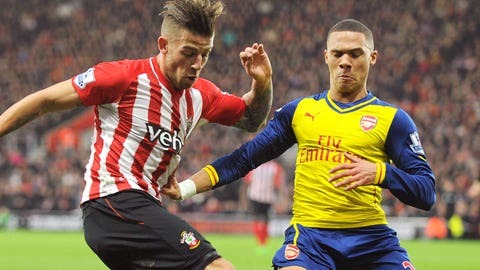 Belgian defender Toby Alderweireld (left) is currently on loan at Southampton from Atletico Madrid. Manchester City are ready to swoop to sign Southampton loanee Toby Alderweireld from Atletico Madrid this summer, Goal understands. After struggling for game time under Diego Simeone last season, the Belgium international has impressed while on loan with the Saints this term, forming a key part of the Premier League’s most miserly defence. City’s director of football, Txiki Begiristain, feels that Alderweireld would be an excellent signing and there is room for the reigning English champions to make a deal happen. Southampton have the option to sign the centre-back permanently for £6million at the end of his loan but Atletico could cancel that clause by paying a £1.5m fee, which would then allow them to sell to the highest bidder. The Spanish side believe that they could extract as much as £14m from City for Alderweireld’s signature. The player himself would be happy to link up with Manuel Pellegrini’s side and could yet attempt to force through a deal, with his priority this summer to stay in the Premier League. As previously revealed by Goal, Manchester United and Arsenal have also been monitoring the Belgian defender. Were Atletico to cancel Alderweireld’s purchase clause at Southampton only to immediately sell to City, it would mirror a similar deal from 2013 in which they bought Martin Demichelis from Malaga before selling him on to Pellegrini’s side later that summer. FOXSoccer.com and Goal.com have teamed up to bring you the best in world soccer coverage. Visit Goal.com, and follow them on Twitter and Facebook.